Hey! Hope you all are having a good time using your goblins to knock down your opponent’s towers. As we all know, Clash Royale has brought up immense success and prosperity to the world of virtual warfare. It’s really interesting how you can command all your troops with a single tap. But you must be aware of the fact that to boost your performance in the game, you’ll need to earn a whole bunch of in-game resources such as cards and gems. Of course, it’s truly a matter of your efforts and dedication towards the game, but why don’t we have look at some easy-peasy and short-term Clash Royale hacks to bank more supplies? The game assigns you a set of milestones, which you need to accomplish, in order to receive exciting rewards. The most likely aspect of Daily Achievements is that they are the most prominent methods to earn you Clash Royale free gems. And if you’re a beginner, it’s a master-key for you to help your performance grow in the future. By completing these tasks, you also get Experience Points. These points are used to level up your profile in the game. On the game’s landing page, you can see a blue bar on the top-left side of your screen, which depicts the requirement for the next level and also your current progress. Don’t forget to check your daily tasks as the first place on entering the game. Whatever tasks show up, work hard to fulfil its terms, to earn free gifts. Before we go on to the mainstream Clash Royale hacks to win any game, we’d like to share with you some information regarding the types of troops in this game. Each of the troops requires different elixir to be deployed, and so it’s important to select the perfect combination of troop cards in your deck. Later in this article, we’ll be talking about several helpful tips to do so. You may have a broad variety of troops, but that’s useless unless you upgrade their performance to the maximum threshold. Troops can be upgraded through their respective cards available in chests, and the card shop (bought with coins). For upgrading them, you’ll have to spend a sum of coins. Invest your resources in upgrading higher tier troops first. This will increase the overall damage of your side. Don’t gamble all your resources over buying new cards, as you get a sufficient number of cards through playing battles and opening chests. It’s nice to keep your deck below 4 elixirs as it becomes really hard to refill the elixirs in between a battle. If you’re a beginner and find it difficult to manage elixir count during a game, you can include an elixir extractor in your deck too. Including a tower-based troop in your deck, can temporarily prevent tower-directed troops such as the Prince from damaging your towers. At least one explosive-based troop such as rockets should be included in your deck, as if in case a large number of enemy troops gather near your tower, you can blow them up. It can also be used to cause instant damage to your opponent during the last phase of the battle. There are various categories of chests present in the game, such as wooden, silver, magical and super-magical chests; and all of them vary on the value of their rewards. These chests will contain huge amounts of coins and cards. Thus, it’s a major plus point of the game. You can earn these by playing battles, and can also be bought from the card shop. As they take a good amount of time to be claimed, it’s beneficial to put them to unlock only when you’re not active in the game, e.g. While sleeping. Always remember to unlock the bigger chests first. You can only unlock one chest at a time, so it’s good to peek at its contents before unlocking it. The in-game card store is an exciting source of common, rare and epic cards at really low prices. The price of many high tier troops is slashed down to half on some special days. So remember to have a daily check. You can also buy chests from the card store using gems. In case if an emergency, you could also replenish your coins’ count by utilising your gems, as available in the in-game store. The most straightforward process of earning crowns, chests and coins in Clash Royale, is to play the battles more often. The number of battles that you win, earn you trophies. These trophies indicate a player’s overall performance in the game. On reaching a certain number of trophies, you get upgraded to a higher arena. Playing more matches also earn you experience points regularly. When you level up based on these points, the health of your towers also increase. After most of the matches, you’ll be receiving a silver chest. Every time that you collect up to 10 coins, you will get a Crown Chest for free. But it’s important to remember that losing a match also decreases our trophies’ count, so keep a regular check on it. Whenever you lose a stream of battles consecutively, don’t give it another try. Because if the count falls below the desired number for an arena, you’ll get downgraded to the lower arena again. Clash Royale’s feature of joining a clan is the most interesting aspect of the game. Join a clan with regular and hard-working players who want to build their foundation in the game. Create new strategies, share replays and portray the true spirit of teamwork in order to uplift your clan’s rating and make it stand out from others. Be nice and supportive to your clan members. Donate the cards that they request for if you have them in excess. In return, you can also request for the cards that you desperately need. By donating cards, you’ll get awarded with coins. So whenever you have the excess of some cards, just donate it to your friends to earn additional coins. Keep watching the gameplay of your clan members to learn new tricks and experiences from them. 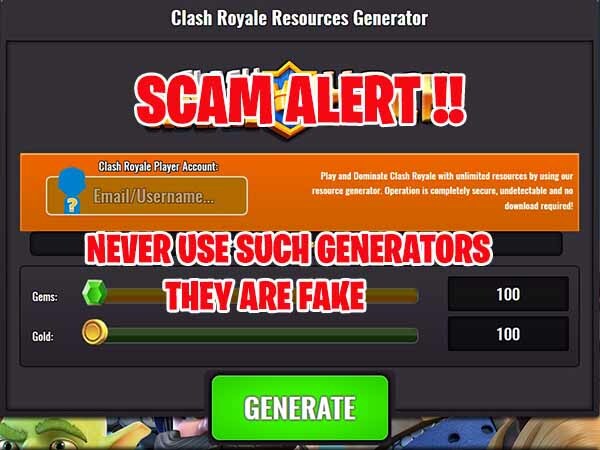 Fact : – Never Ever Use Clash Royale Hack Tool Or Gems Generator : They Are Scams!! There are numerous websites promoting this kind of an unlawful pursuit in the game. They claim to provide their users with unlimited Clash Royale free gems and coins in a matter of seconds. But they are all untrusted and unauthorized, as in no way have they ever been linked to the game’s original developers. Do not share any important credentials in the app, as they are mostly traded with marketing agencies; thus putting your privacy at a huge stake. Do not link your original game account to such illicit apps or websites, as it may lead to penalties being imposed on your profile. Only use legitimate and trusted Clash Royale hacks, as mentioned above in this article, to get the maximum benefits in the game. What is the Right Way to Earn Gems in Clash Royale? I’d surely suggest that the most effective method to improve your expertise in the game, is to give it enough time and patience. This way, you can get completely familiarized with it in just a couple of weeks. Incorporating illegal ways to generate unlimited coins and gems, will make your skills in the game, no better.